WASHINGTON – In ceremonies held on June 13, 2018, Full Circle Communities’ Milwaukee Avenue Apartments was recognized at the 24th Annual Charles L. Edson Tax Credit Excellence Awards. 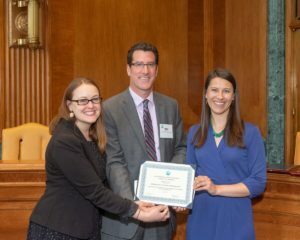 The Affordable Housing Tax Credit Coalition recognized the Chicago-based non-profit for their innovative development in the Special Needs Housing category. Milwaukee Avenue Apartments was selected as an honorable mention amongst hundreds of applicants by a national panel of judges. This is not the first time Milwaukee Avenue Apartments has been honored for excellence in special needs housing. In 2017, the Illinois Housing Development Authority (IHDA) awarded the project the Gale Cincotta Housing Champion Award for Innovation in Affordable Housing. Milwaukee Avenue Apartments was chosen because its design provides universal accessibility without significantly increasing the overall development cost. Located at 3064 N. Milwaukee Avenue in Chicago, the development consists of 32 one- and two-bedroom apartments, all designed for persons with disabilities. With doors opening in 2015, Milwaukee Avenue Apartments has provided an affordable and accessible home in a neighborhood with rapidly rising rent. Included are on-site management and service offices, a library, computer room, community room, and resident garden. Each unit is designed for maximum livability, with cabinets and countertops that are adjustable, roll-in showers, adjustable closet organizers, and audio-visual entry and alert devices. The $9.8 million development project was made possible through Housing Tax Credits issued by IHDA and purchased by National Equity Fund, Inc., a Permanent Supportive Housing Grant from IHDA, City of Chicago TIF Funds, an Illinois Department of Commerce and Economic Opportunity green-design grant, and developer equity. Construction financing was provided by Bank of America. The development received support and resident referrals from local organizations including Center for Changing Lives, Northwest Side Housing Center, Hands to Help Ministries, Irving Park Lutheran Church, St. Viator Parish, Bickerdike Redevelopment Corporation, Avondale Neighborhood Association, Logan Square Neighborhood Association, Latin United Community Housing Association, Thresholds, the Illinois State Referral Network, Chicago Housing Authority, and Over the Rainbow Association, who also provides on-site tenant services. All units are affordable to persons earning less than 60% of the Area Median Income. Full Circle Communities is a Chicagoland philanthropic non-profit with the mission of expanding access to affordable housing through preservation and development, thoughtful design, and the provision of significant and contextual services. To accomplish this, Full Circle dedicates 75% of their project cash flow to providing services for their residents. In addition to their properties in Illinois, Full Circle also owns properties in Michigan, Iowa, and Florida, for a total portfolio of 900 units.